Saturday Day Dot Food labels / stickers. 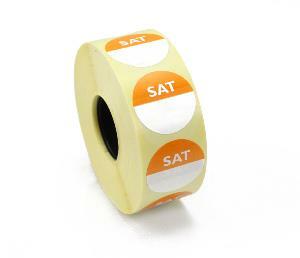 Saturday Colour Coded (Orange) Day Dot date labels.These labels measure at 25 mm in diameter and have been manufactured in rolls of 1,000 labels with a 25 mm core. These labels are extremely popular with various different food establishments such as Restaurants, Cafe's & Street Food sellers. The labels can come with either a Permanent or Peelable adhesive (Please select from the drop down menu). Monday Day Dot Food labels / stickers. Tuesday Day Dot Food labels / stickers. Wednesday Day Dot Food labels / stickers. Thursday Day Dot Food labels / stickers. Friday Day Dot Food labels / stickers.